Steeped in culture and breathtaking landscapes, this 10 bedroom, 10 bathroom villa is on an exclusive country estate in west central Tuscany. 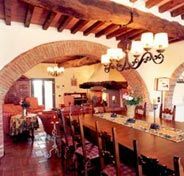 This magnificant villa dates back to the 1400's. The estate dates back to the 12thC. The villa is on it's original site and the original features of the house have been conserved. 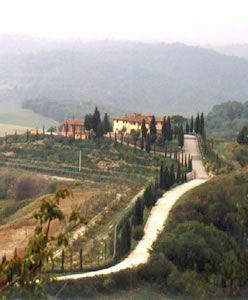 Formerly a hunting lodge this villa is a superb Tuscan country villa with a perfect, secluded, hill top location. It provides a magnificent backdrop for a truly unique Tuscan experience. Contact Ginger for more information on this lovely restored hunting lodge. A winding, tree-lined, private country road leads to the property, which is situated within its own gated grounds and gardens. A privately owned family home, totally restored for personal use, this villa is a highly comfortable, luxury property. The focal point of the property is the spectacular infinity pool. Strategically placed, this excellent pool enjoys superb exposure literally from sunrise to sunset and from the crystal clear water your only view is the sweeping Tuscan panorama. The extremely spacious ground floor living area opens out through a series of original Tuscan brick archways. 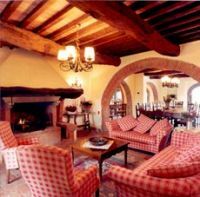 On the one side a cosy sitting/reading room offers Sat tv and VCR facilities, then around the corner the superb main lounge area is dominated by a great old Tuscan fireplace. The magnificent double-dining area features a beautiful heavy antique main table that opens up to seat more than 25 guests quite easily. The villa offers 10 bedrooms, comprising 6 elegant double rooms and 2 spacious suites, all with ensuite or private bathrooms and can therefore accommodate generously up to 20 guests. 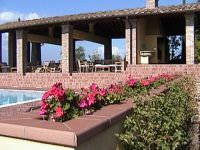 The pool is shaded by a beautiful loggia, which is an open Tuscan brickwork, terracotta tiled, veranda. Furnished with the most sumptuous, teak, colonial style furniture, the loggia overlooks and leads directly down onto the poolside sun terrace. Adjacent to the loggia is a larger than large open barbecue and grill, with roasting spit, large stone washbasin and work area. The beautifully landscaped garden offers extensive Mediterranean shrub and herbaceous borders, rose and lavender gardens, pine and cypress trees, an olive grove and a large flat lawn area which is an ideal play area for children. Both the pool and gardens are lit at night.